Light at 889 nanometers is strongly absorbed by atmospheric methane. 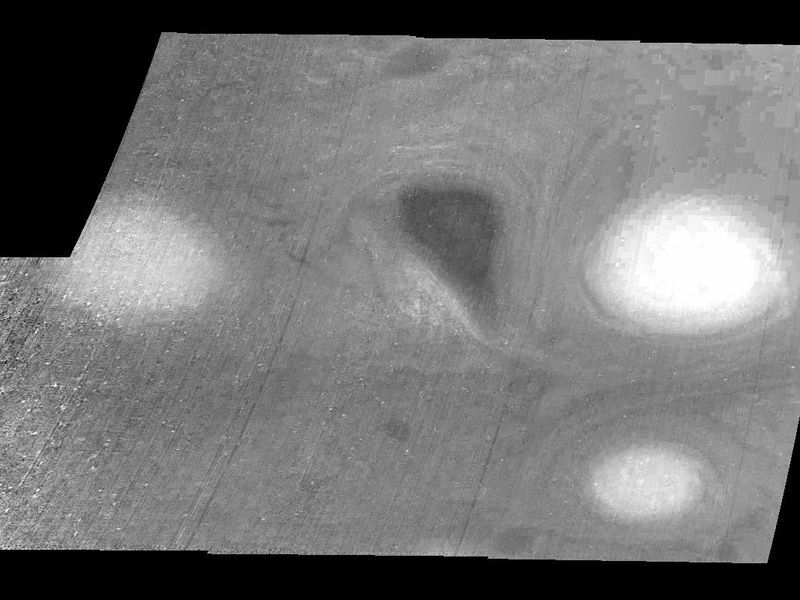 This mosaic shows the features of a hazy cloud layer tens of kilometers above Jupiter's main visible cloud deck. This haze varies in height but appears to be present over the entire region. Small patches of very bright clouds may be similar to terrestrial thunderstorms. Oval cloud systems of this type are often associated with chaotic cyclonic systems such as the balloon shaped vortex seen here between the well formed ovals. This system is centered near 30 degrees south planetocentric latitude and 100 degrees west longitude and rotates in a clockwise sense about its center. 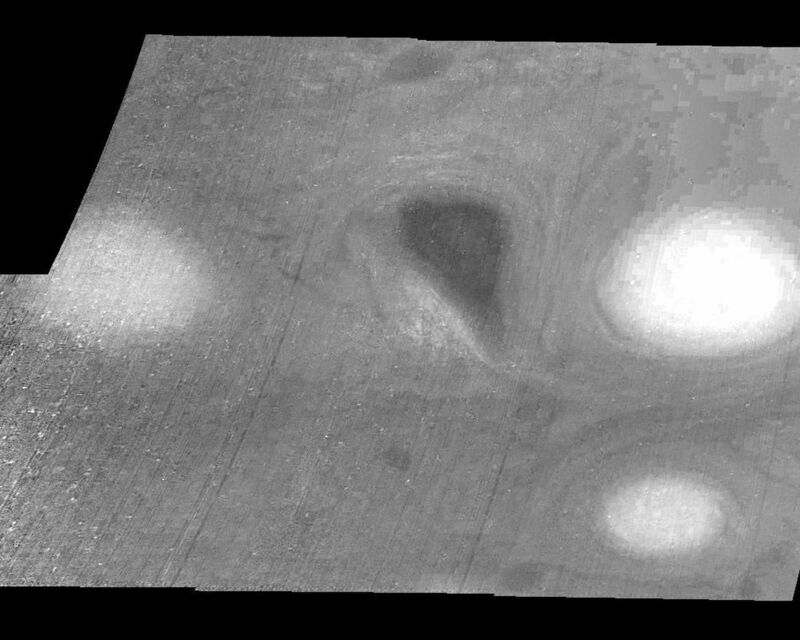 The oval shaped vortices in the upper half of the mosaic are two of the three long-lived White Ovals that formed to the south of the Red Spot in the 1930's and, like the Red Spot, rotate in a counterclockwise sense. The east to west dimension of the leftmost White Oval is 9000 kilometers (km). (The diameter of the Earth is 12,756 km.) The White Ovals drift in longitude relative to one another, and are presently restricting the cyclonic structure. To the south, the smaller oval and its accompanying cyclonic system are moving eastward at about 0.4 degrees per day relative to the larger ovals. The interaction between these two cyclonic storm systems is producing high, thick cumulus-like clouds in the southern part of the more northerly trapped system. North is at the top of this mosaic. The smallest resolved features are tens of kilometers in size. 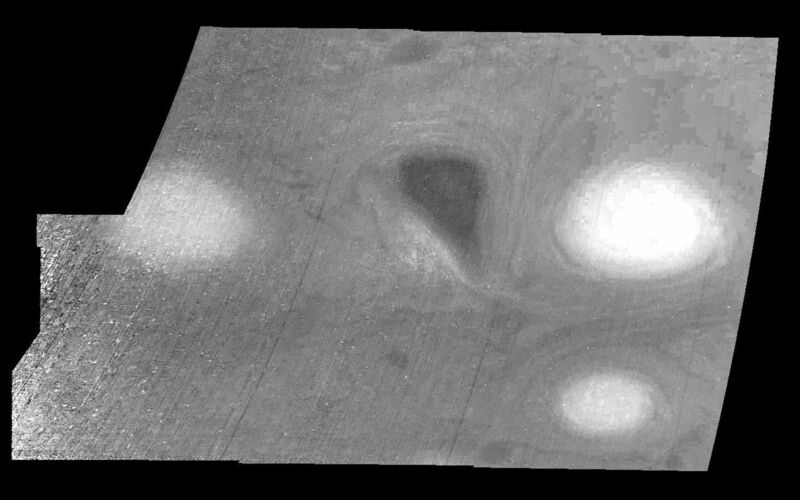 These images were taken on February 19, 1997, at a range of 1.1 million kilometers by the Solid State Imaging (CCD) system aboard NASA's Galileo spacecraft.